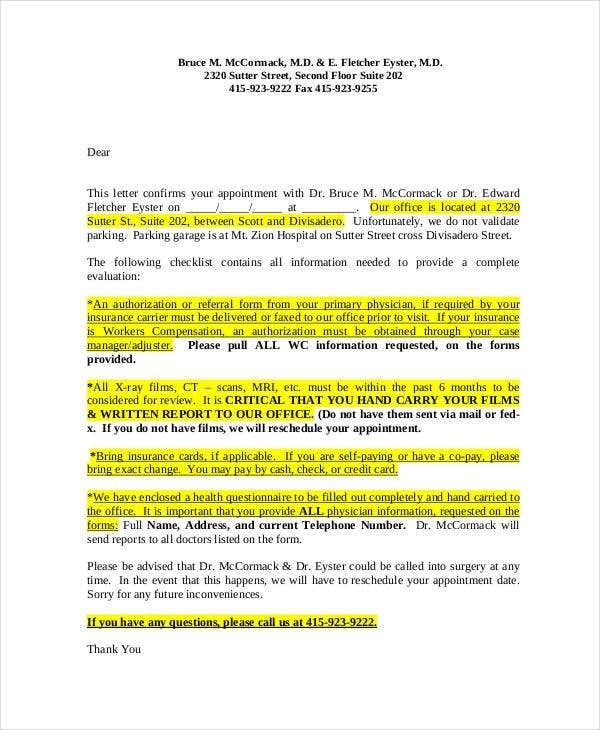 There are different ways that an appointment letter may be used. 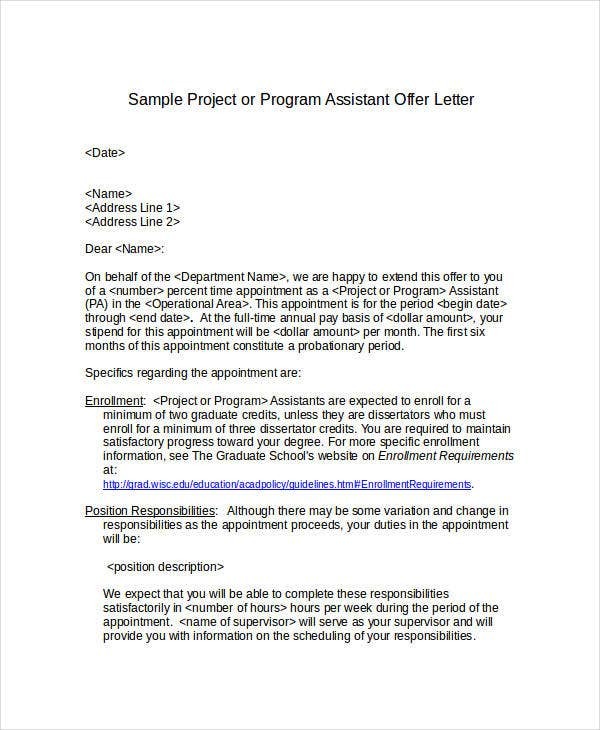 The functions of an appointment letter can be beneficial in scheduling and rescheduling activities and programs or in the process of appointing someone for a specific job position. 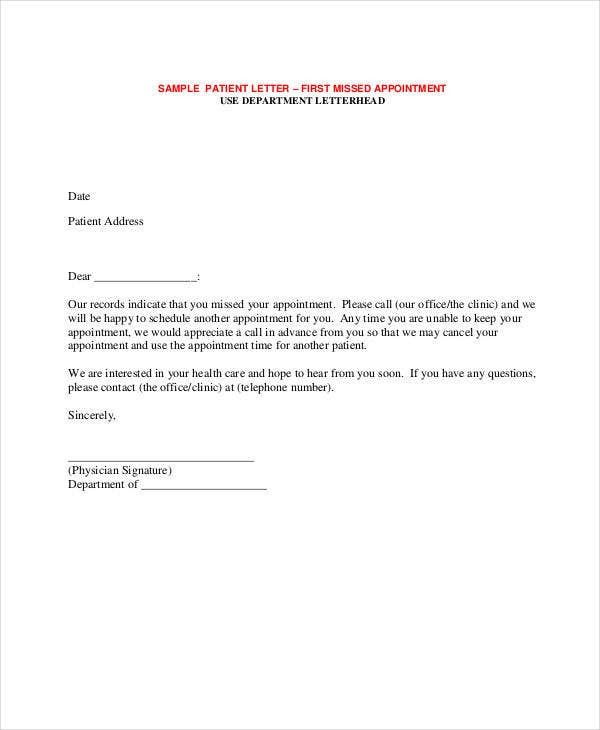 The content and format of an appointment letter vary on its purpose of usage. 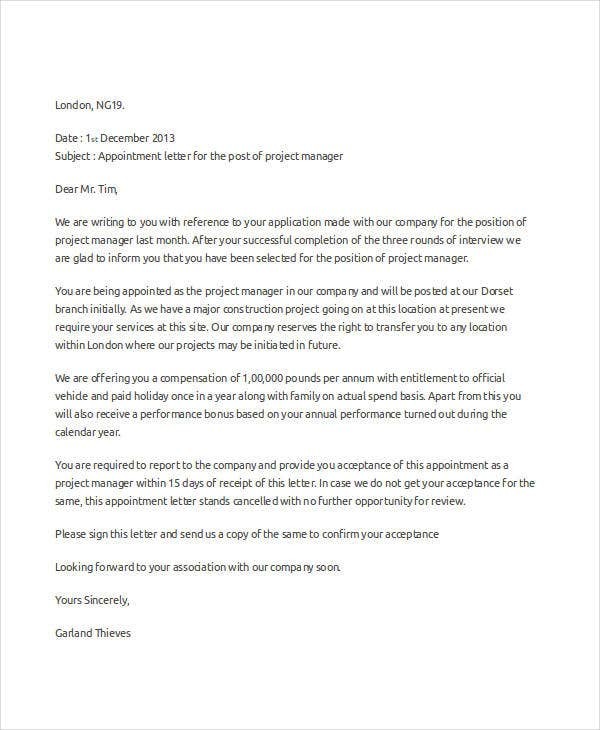 If you would like to have a reference in creating this particular kind of letter, make sure that you will follow one that is related to the particular appointment subject that you would like to discuss. 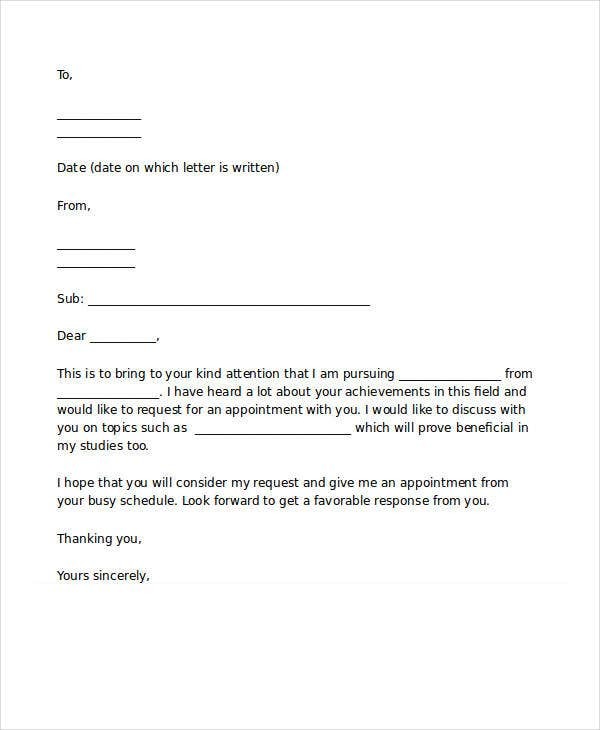 This post is a collection of appointment letter templates and samples that you may use as guides in creating specific appointment letters that is appropriate for the current appointment transaction that you are involved in. 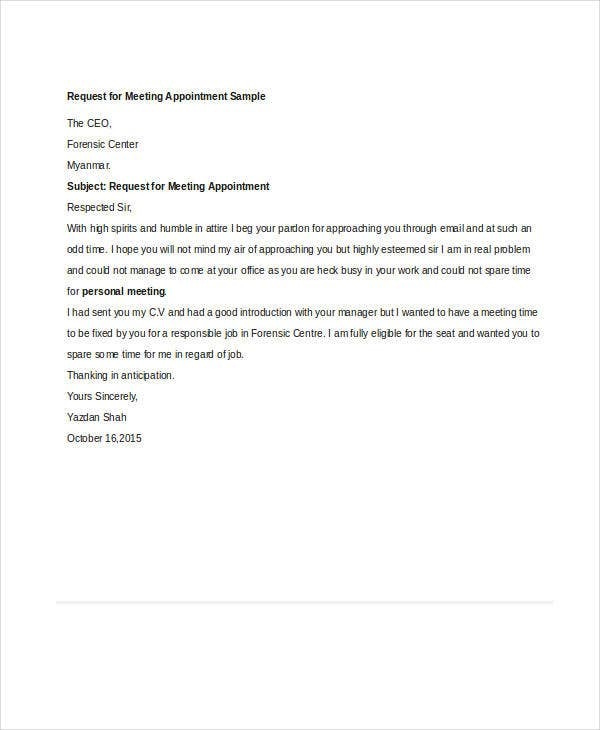 Other than that, we can also provide you with samples of Business Appointment Letter Templates in the provided link for additional references. You can use an appointment letter to request for a medical doctor or dentist’s schedule for check-up, consultation, or any other processes where their expert services are needed. 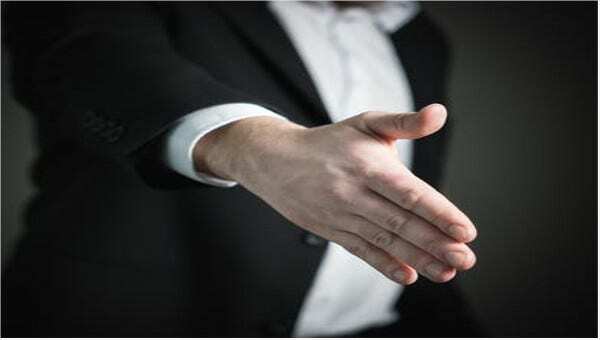 Appointment letters may also be used for business meetings and other corporate gatherings where a specific professional transaction/discussion will occur. There are also times when appointment letters are needed for properly scheduling pet grooming and vaccination. 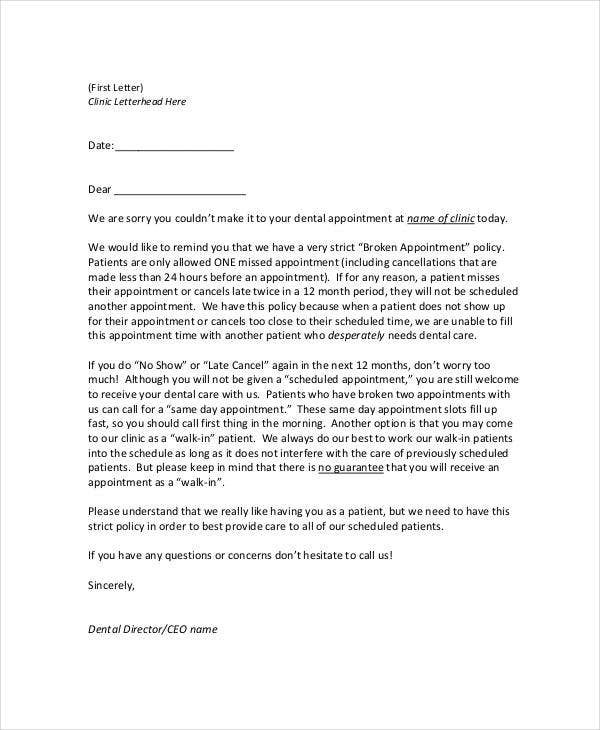 Always remember to include the purpose of your appointment request. Make sure that the person to whom the letter is for will have a full idea of what the meeting is all about. More so, you can explain the reasons either on why he or she needs to attend the meeting or why you actually need him or her. 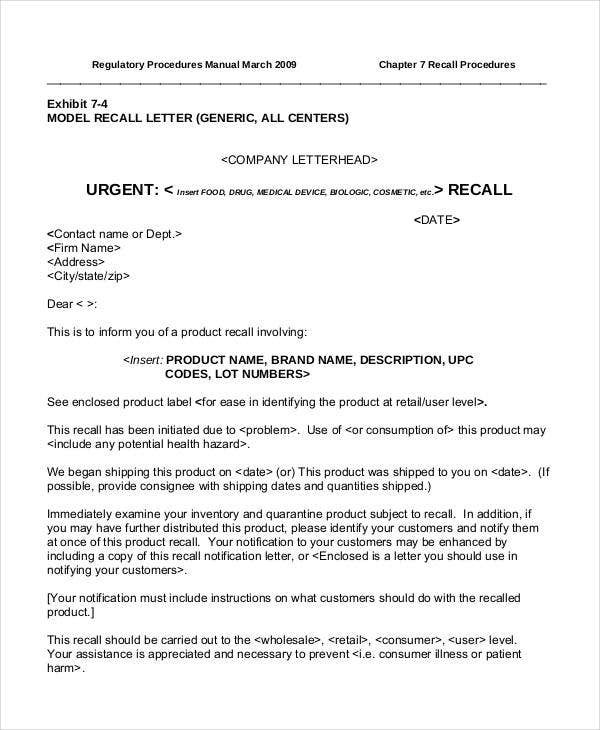 Assure that the information that the letter receiver needs to be aware of are all included in the letter. There is nothing more effective than a comprehensive appointment letter as there will be lesser questions with regards to the occurrences involved in the appointment. It is very important for you to put the date when the response of the letter receiver is requested especially if there are other kinds of appointments form the end of the letter receiver that can occupy the time frame that you are requesting. 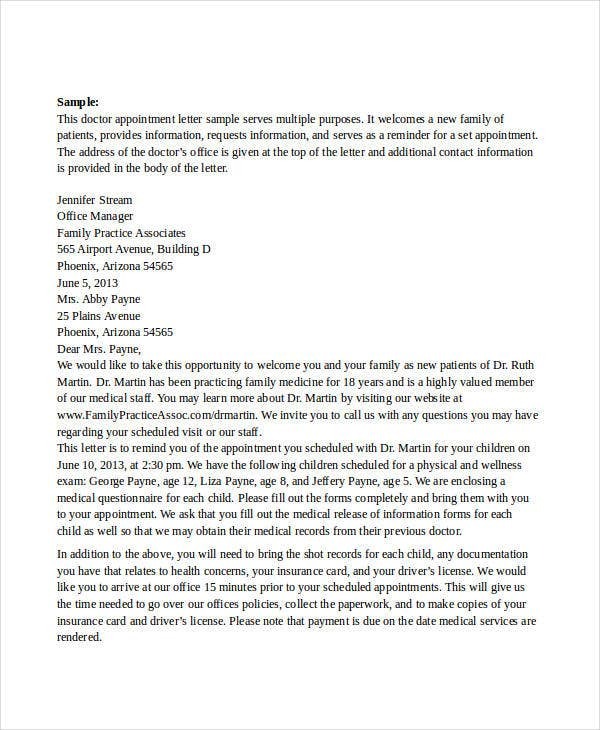 Make sure that your appointment letter is formally written especially if you will send it to a professional or to a business entity. It is very important for your language to be businesslike and the content of your letter to be organized in terms of its formatting. Again, you can suggest the date and/or time of the meeting. It depends on the transaction if the location of the meeting is workable. However, be reminded that your request date and time may not always be granted. Be open to the possibility that the letter receiver might suggest another date for the transaction for reasons that he or she may or may not include in his or her letter response. If you have fully planned the appointment that you are requesting for, you can include the expected time duration of the meeting. More so, you can also request for the items that should be present during the discussion may it be documents, tools, or any other materials that are needed for the execution of the activity that will occur during the meeting. Assure that the letter receiver is aware of the number of meeting attendees. Write the number or the specific names of the entities who will be present in the meeting, if there are any. It is very important for you to identify the kind of meeting that will occur and why the presence of the people who will attend are essential. For the letter receiver to have an easier time to contact you back other than sending another letter, you may include your contact details in the letter and the best time that you may be contacted. Sending an appointment rescheduling letter is a way of showing respect to the time and schedule of the entity on the other end of the transaction. 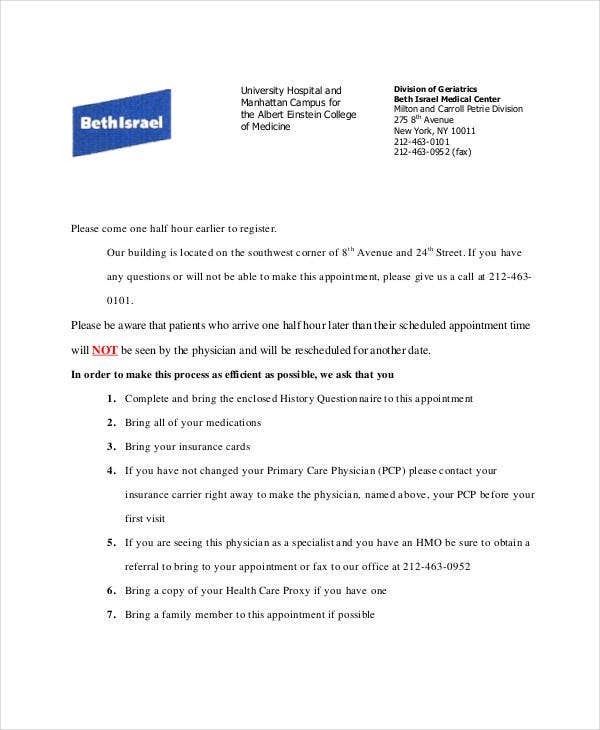 If an appointment rescheduling letter is sent, the person who will receive the letter can make new plans to fully maximize the usage of his / her time. Appointment rescheduling letters, especially those that are used in transactions related to medical check-ups, can give way for new patients or any other entities to get the schedule that will be vacated. An appointment rescheduling letter is a formal way of announcing that a specific scheduled meeting will not push through anymore. 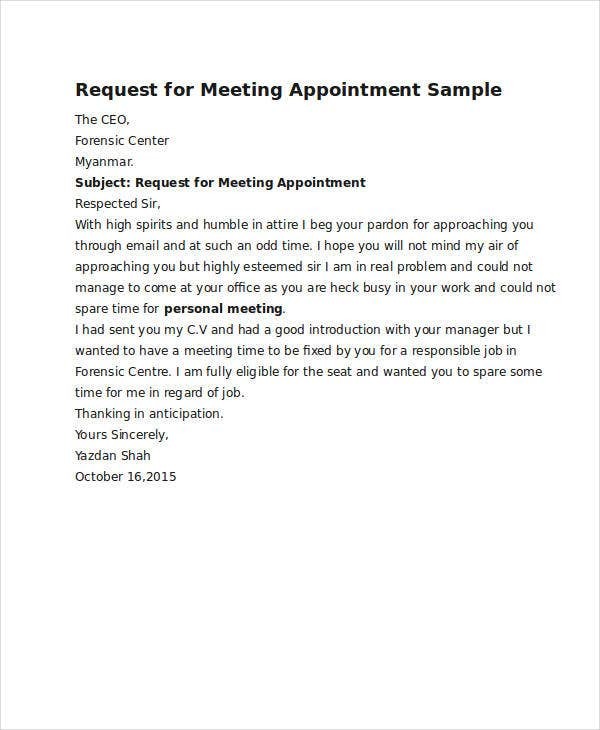 On the end of the letter sender, it can assure him or her that the meeting will be placed to another schedule. The letter sender may have forgotten that he or she have prior commitments. The letter sender may have experienced an incident or minor accident a few days before the scheduled meeting. Something might came up which is more important to be prioritized compared to the scheduled meeting. Make sure to apologize for the inconveniences that the request for rescheduling may brought. Remember that you are not the only one who have personal and professional schedules to follow. Always be polite in asking for another schedule. If your schedule is all packed up, you can give a few date selections that the letter receiver may choose from. More so, if the appointment can be done in any other dates, allow the letter receiver to select the new schedule where he or she is most comfortable to meet-up. Assure the letter receiver that you will not cancel the transaction and you just would like to cancel it for now and reschedule it on other dates. If the reason for the rescheduling is not too personal or if it is required in the transaction, make sure that you will clearly and precisely state the reason on why you could not make it on the meeting date. It is very important for you to be accurate with the new schedule and the things that are involved in the meeting. Make sure that you will inform the letter receiver regarding the items that will change on the new schedule from the initial meeting date. 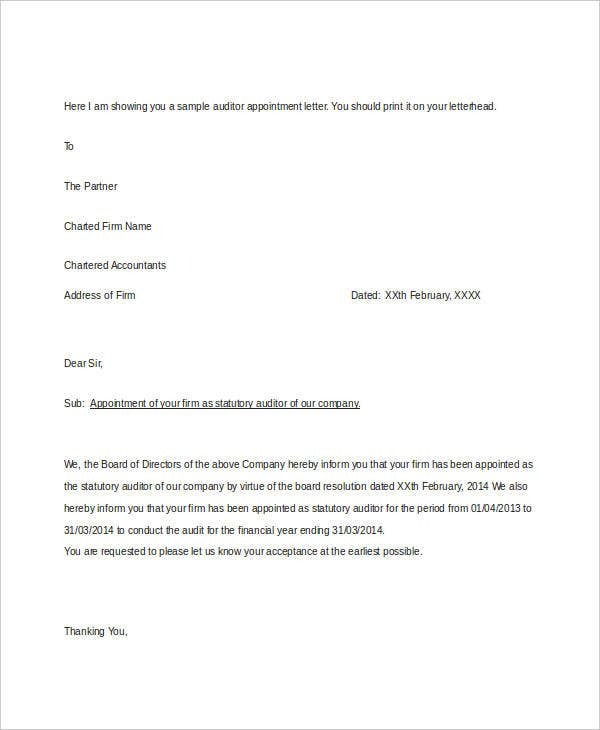 Other than the appointment letter samples that are already available for download in this post, we can provide you with more downloadable samples and templates of Temporary Appointment Letters in the provided link. 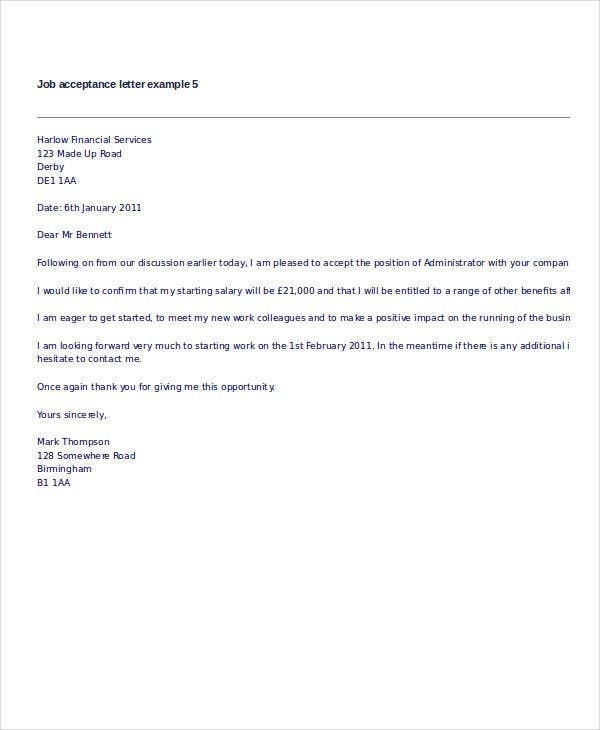 What Should You Include in Your Interview Appointment Letter? What Do You Write in Your Job Appointment Letter? 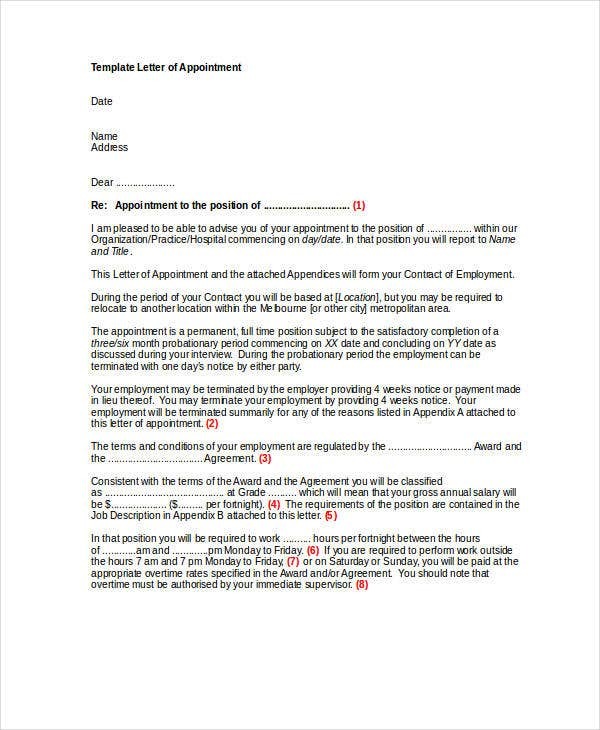 A Job Appointment Letter is the document that is given to a qualified applicant who have already reviewed an initial job offer letter. 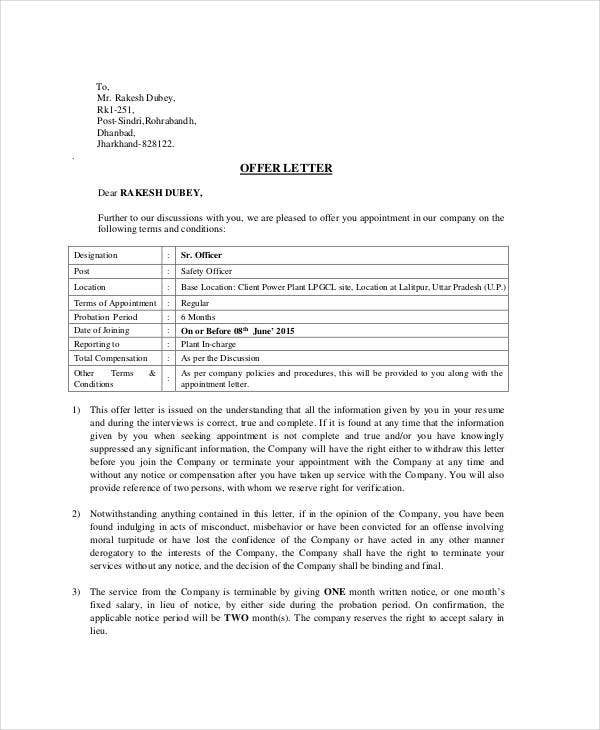 A job appointment letter can only be given to a candidate if he / she does not want to change anything in terms of the company offer anymore. 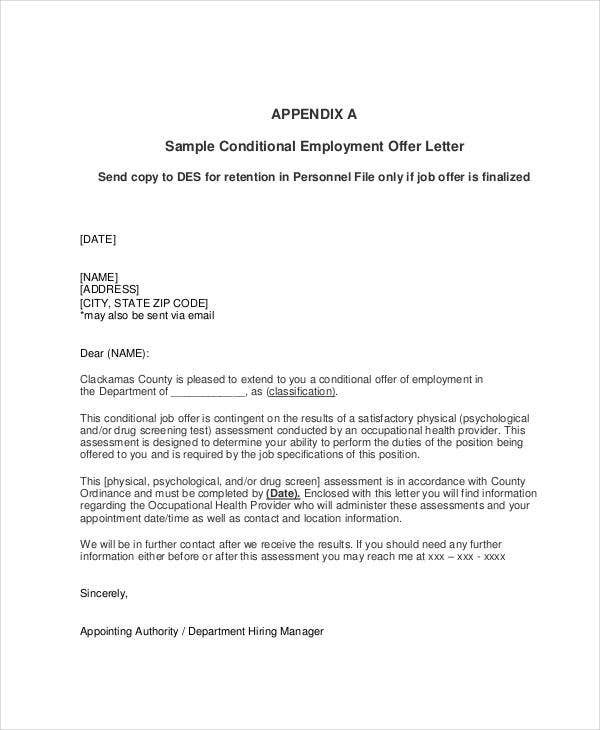 A job appointment letter should be realistic. Set the warm tone of the letter but also assure that the document will set the proper expectations of the person to whom the letter is for. 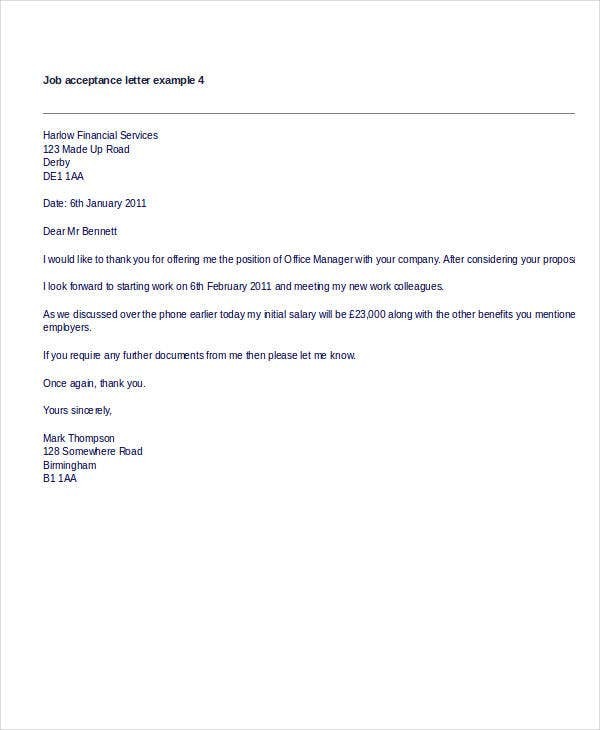 Make sure that you will put the date when the job appointment letter has been written and sent to the qualified candidate. 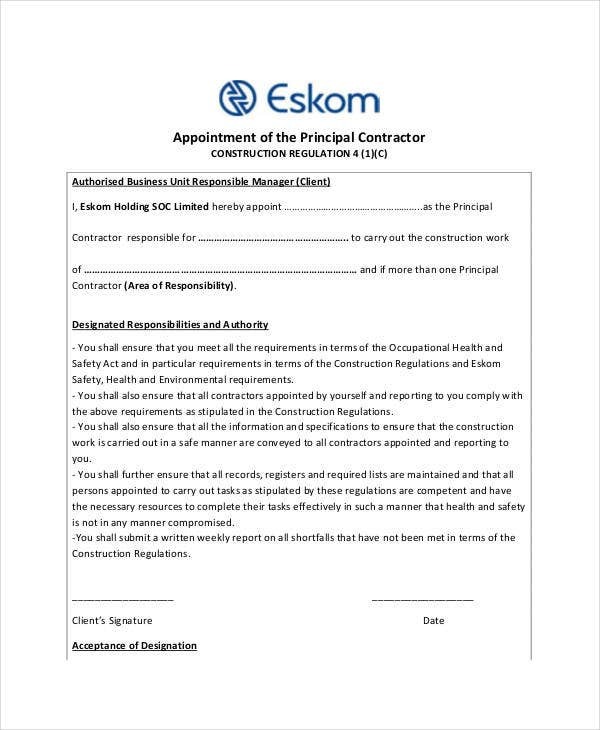 This is very important especially if the company have a set date when the possible new employee is required to sign the document and give it back to the human resource department. Follow a format that you will implement all throughout the document. Your job appointment letter should look polished, professional, and well-curated. 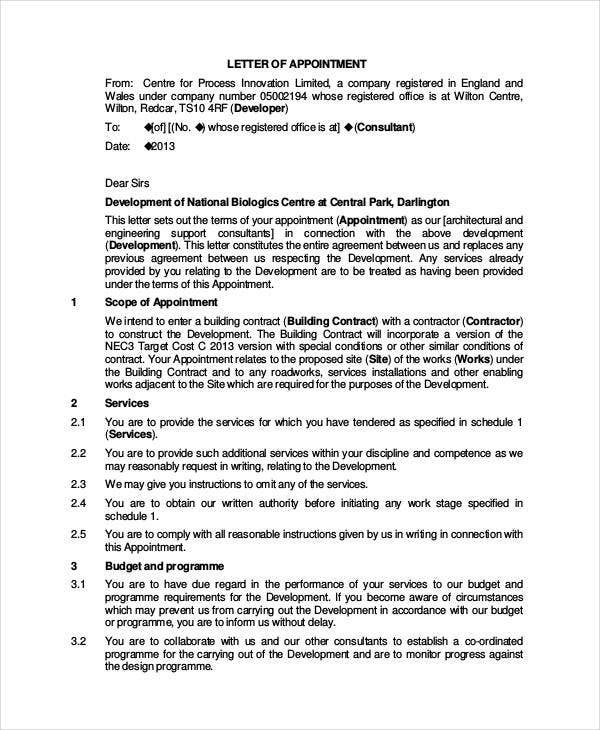 The job appointment letter that you will create should be direct to the point. As much as possible, use words that are precise. Be careful with the usage of words and phrases to avoid misinterpretation. Aside from the things that you can provide to the applicant, make sure that the applicant will also be aware of the expectations of the company with regards to his/her work performance. 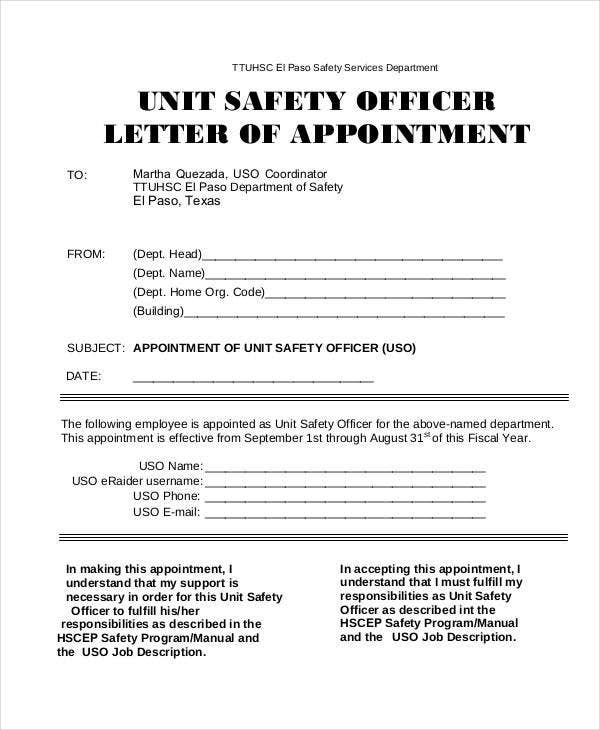 Assure that your job appointment letter is comprehensive. 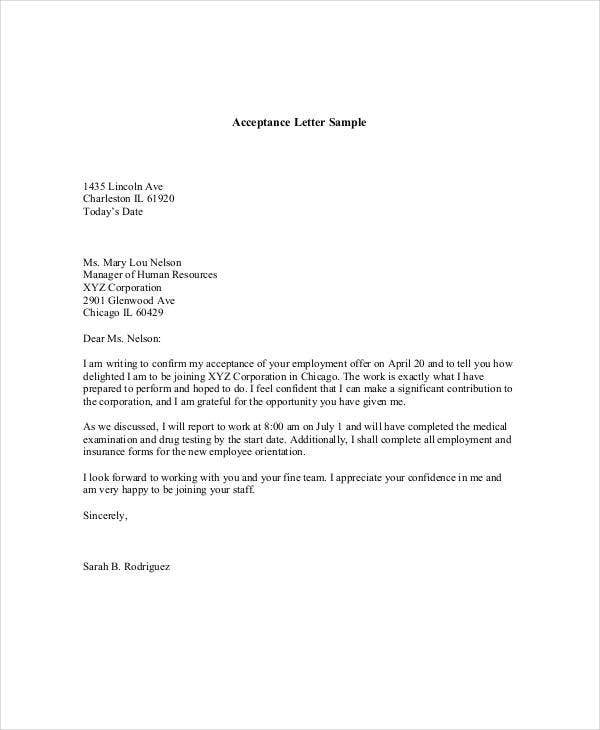 It is essential for a job appointment letter to fully cover all the things that the new employee should be aware of especially with regard to company operations and his/her job functions. 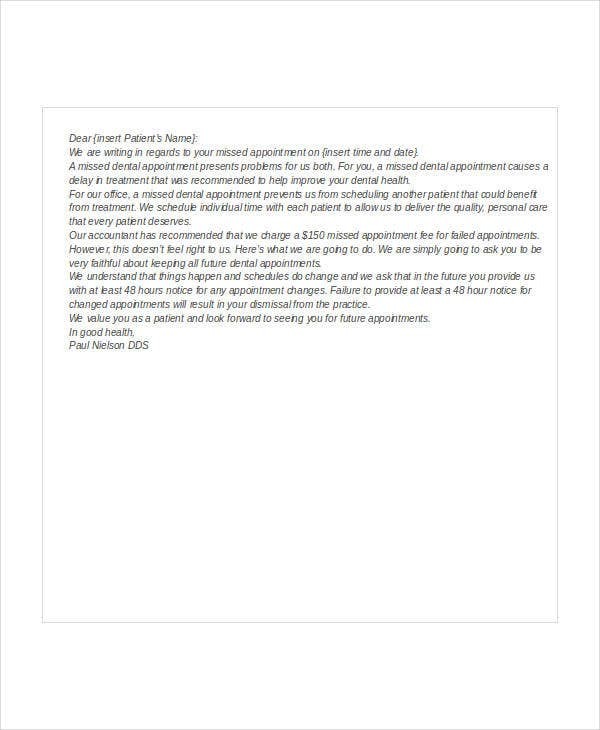 Why Use Our Appointment Letter Templates? 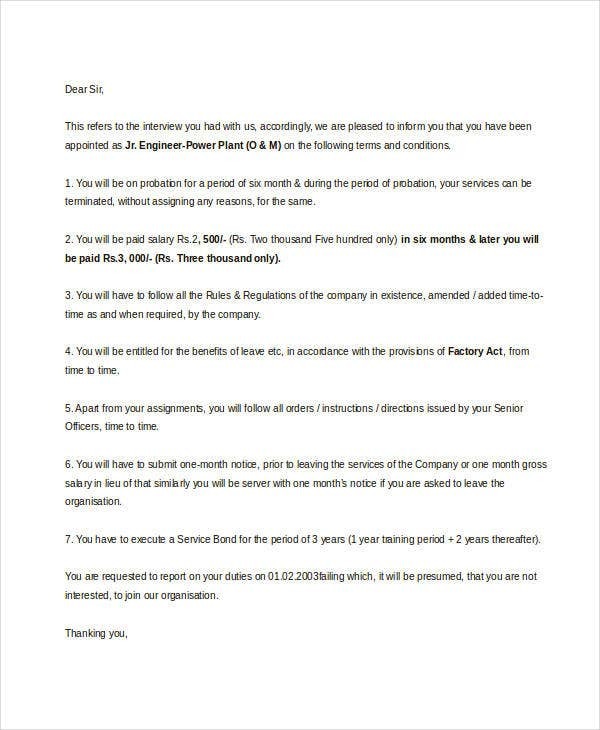 The appointment letter templates that are available for download in this article can be used in different transactions where an appointment is needed. 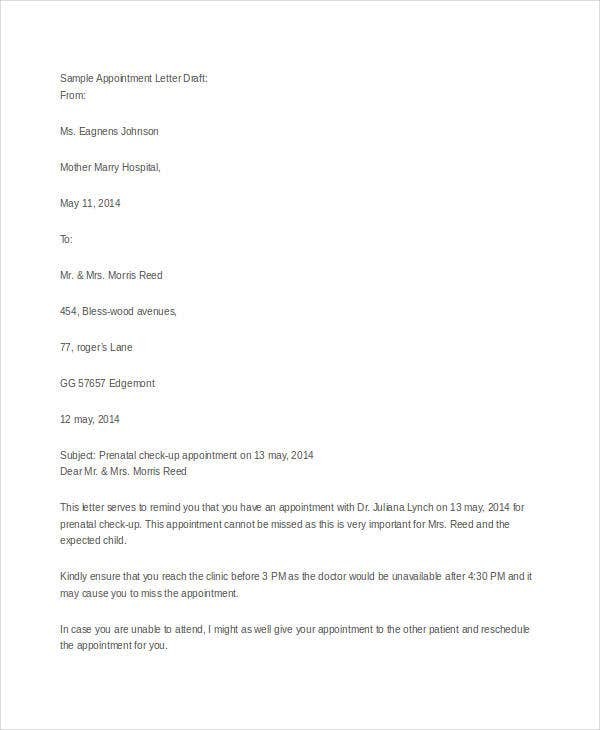 With the variety of usage of appointment letter templates, it is very important for you to be sure that you are using the appropriate appointment letter template as a reference. 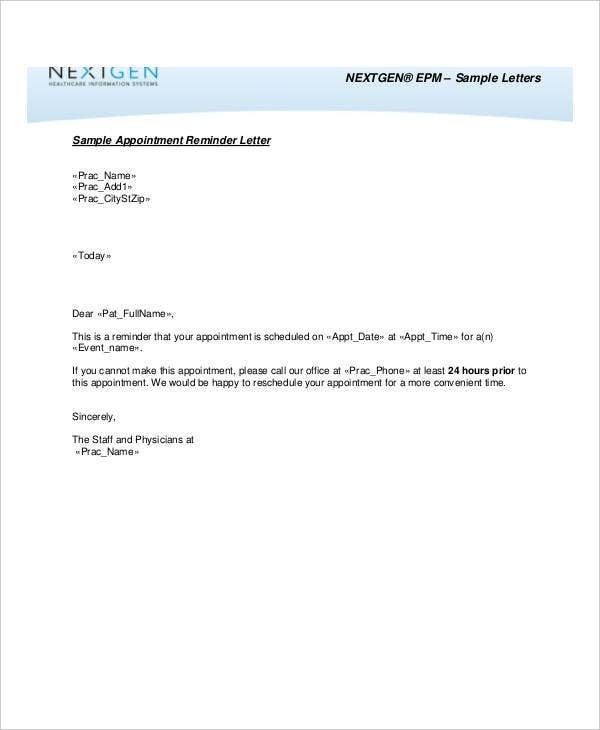 Our appointment letter templates are formatted based on its uses. 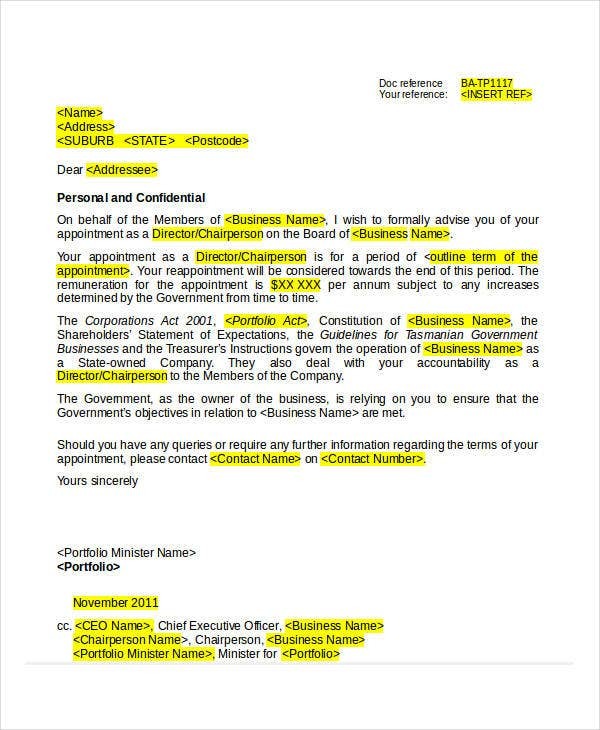 We made sure that all the documents in this post are formal looking and businesslike. There are already existing content on some of our samples and templates. With this, you can easily identify the items that you may put in your appointment letter. All you need to do is edit the initial content present in our templates and replace it with the details that are appropriate to be used in the current transaction where you are involved. 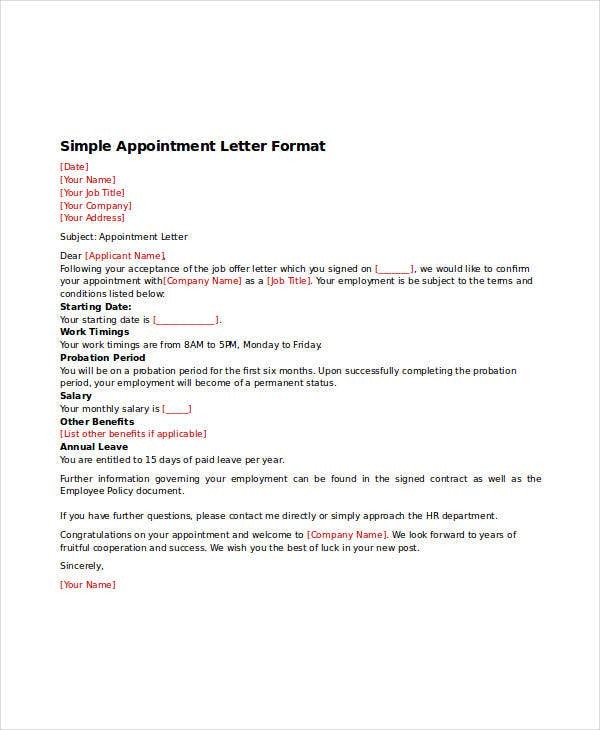 Aside from our samples of appointment letter templates, you may also be interested to browse through and download our samples of Application Letter Formats and Job Application Letters for Web Designer templates.